An apron pattern and tutorial that is so easy to make! This is a teacher apron or vendor apron that is highly functional with a total of 6 pockets! 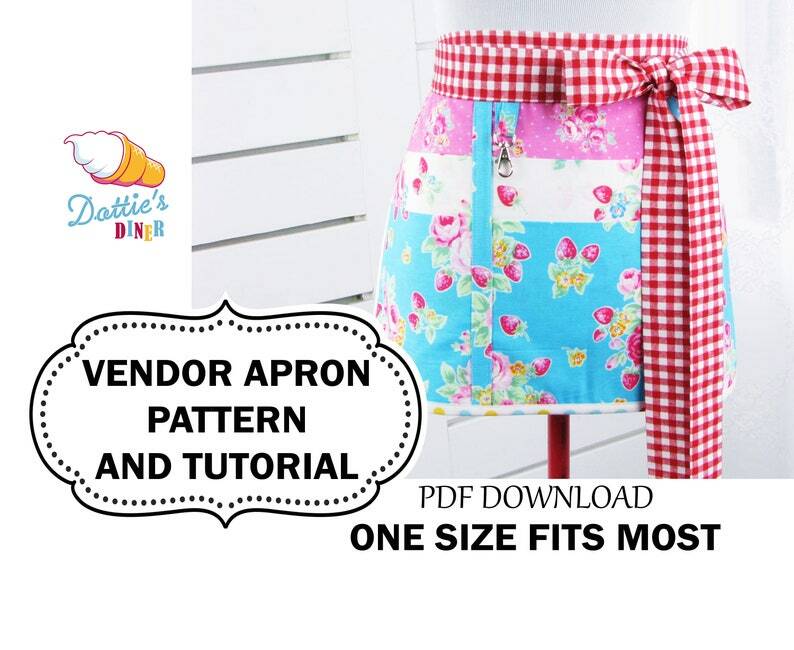 •	A digital PDF tutorial booklet with lots of color photos of the apron making process. •	A pattern that you print across 8 pages, cut out, and tape together. •	Pieces: main skirt front and back, 9" pocket, 7" pocket, key fob, and waist ties. HOW DO I PRINT IT ALL? I arranged the pattern pieces across several sheets of paper, with an alignment page that shows you how to align the pieces after printing, and tape them together. It should be super easy to print the PDF. WHAT IF I CAN’T FIND MY DIGITAL DOWNLOAD? Most of the steps in making this apron do not require a seam allowance, except for the ties. Use a 1/4 to 1/2 inch seam allowance, or whatever you are comfortable with, it really does not matter in the grand scheme of things. Remember, the beauty of making aprons is the fact that it’s an apron, it does not need to be all perfect. CAN I SELL THESE APRONS IN MY ETSY SHOP? Sure why not. I would love to see what you make! WHAT SIZE IS THE PATTERN? The pattern is generally a one size fits all. The waist ties are a total of 3 yards long, which pretty much fits any size, and on smaller women can wrap around front and be tied in a bow in front. Aprons are generally worn tied on, and not expected to have full coverage in back. Thank you for stopping in dolls. Love this new pattern! Great directions, very easy to follow.